Do you have things that you really love, because someone special gave them to you, but just can’t find a way to make them work in your decor? Indiana Glass Company’s Hen On A Nests, to be exact. I have a pale pink one and a clear glass one, in addition to this milk glass one. So I have a total of three of these hens in my brood. My Mom collected these things and I generally just keep them cooped up in my china cabinet. I love them because my Mom loved them so much, but I just find them so hard to use around the house. Why do women hate me because I’m beautiful? So until they start selling these things in Pottery Barn and they become all the rage with the 20-somethings, how do you make them look stylish? Jelly beans make anything look fun and fashionable. OK, now I’m using a chicken as an excuse to buy jelly beans. How far I have fallen. BTW, do you think it’s a marketing ploy by Brach’s to only put maybe ten red and orange jelly beans in a bag? I mean after the red and orange are gone, I’ll move on the the purple, but after that it’s pretty much all downhill. I bought two bags today, just so I could get my fill of the good colors. Do you have any glass chickens? Where do they roost in your house? 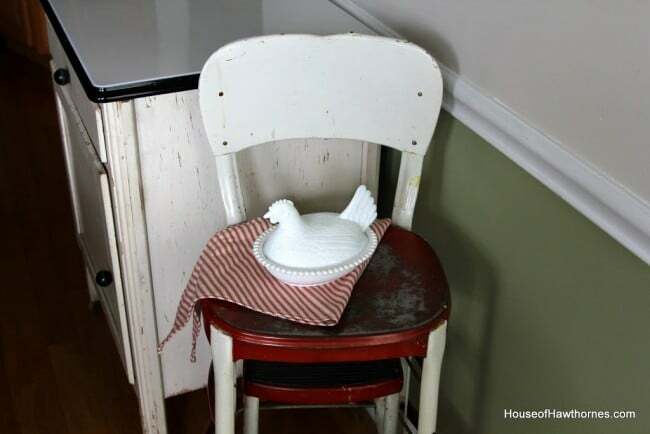 Linking with Common Ground‘s Inspiration Friday and French Country Cottage‘s Feathered Nest Friday. I do love these chickens! But I grew up on a farm where we raised chickens.. and I’m from Indiana…but you are right about using them?? My mom had these lovely chickens too. Probably still does but I haven’t seen them in awhile. Poor things. They are probably packed away missing out on all the jelly bean fun. Loved your thoughts on jelly beans, Pam. I only eat the black ones. Yes, I know. Weird. But I do love your chicks though I wouldn’t know where to put them in my house either. I had (notice the past tense)a porcelain top table that was my late husband’s grandma’s but could never find a place for it in my homes so I’ve given it to my daughter. She’s got it in her kitchen and though it doesn’t really go in their 1960s two story, at least it’s out of the basement. Your chickens are a nice reminder of your mom, I imagine. Have a happy Easter. I can’t think of a better way to decorate than to fill them full of jelly beans! Great idea! I had one many years ago but somehow I lost it when we moved. Haven’t missed it a minute until I saw yours with the jelly beans! Hope you have a great Easter! Hi Pam, thanks so much for visiting me on my blog! I am glad you liked the coffee filter wreath! You should try it again, I didn’t like mine until I finished it all the way. Unfortunately, I don’t have any of these sweet chickens. But I’d love to have one of the white ones some day! I have a pink clear one that comes in a Longaberger basket that someone gave me a couple years ago. I like it…..but I think it looks cute in the basket and it reminds me of depression glass…….don’t think I would want three. I think you need hershey kisses in them…or those cute little eggs. I have one footed covered rooster on my hutch! 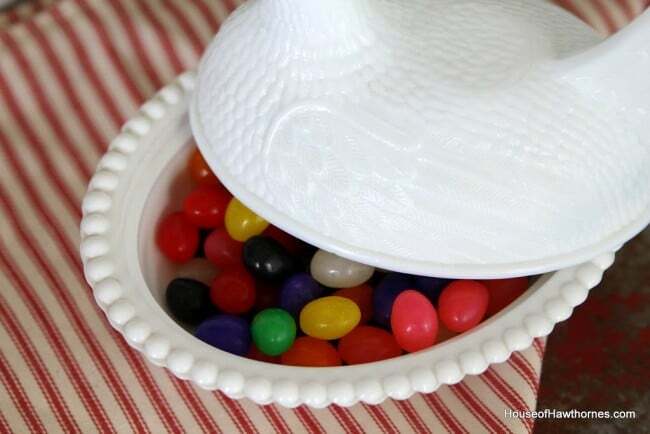 Love your idea for using it for jelly beans! 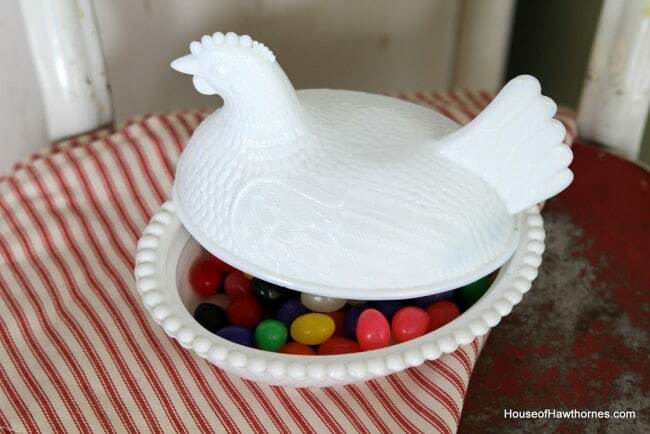 No chickens at our house, but I’m all for putting jelly beans in pretty dishes! =) Here’s the big question, though. Fruity or spicy???? We always use ours for jelly beans or chocolate eggs for Easter. 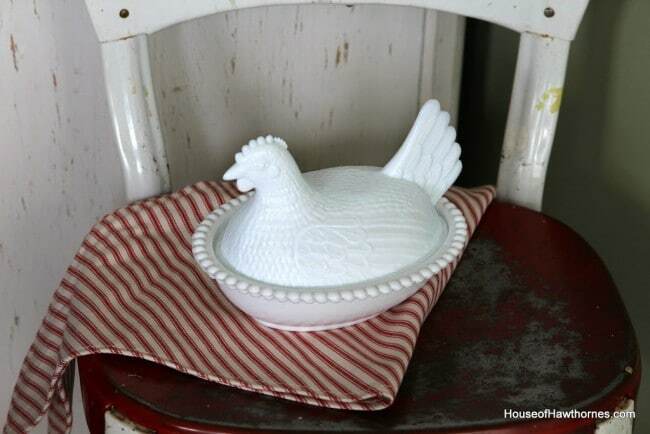 Occasionally its been used as a covered butter dish. Mostly it sits among the pretties in the China hutch waiting for Easter. So on behalf of all chickens on a nest out there roosting and lonely…give them a special day this Easter and memories to hold them over till their next big day of freedom! I actually have a rather large brood of these. Tops only. Rescued them at a yard sale a few years back. They are fun lined up on the mantel for Easter. Assuming I actually bothered to haul out the Easter bins which has not occurred for three years in a row now! Don’t worry. Someone will put them on a blog. Then four million people will pin them and suddenly these chicks will be THE next big thing. Then PB will do reproductions which will cost infinitely more than we would charge for the originals. Of course they will call them vintage which will confuse the twenty somethings who think the vintage maps at Ballard are actually old. Oh wait, I seem to have gone off on a tangent here…! 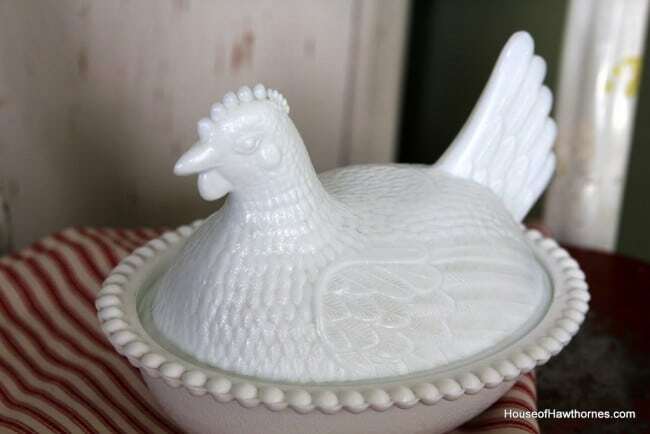 I’m not a chicken or milk glass person myself. Once upon a time I was, but no more. My mom LOVES them, though. The jellybeans are good. I love the licorce ones. Or the JELLY BELLY flavored ones. HAPPY EASTER. Take care. Nope no glass chickens yet… but someday I’ll have a great big beautiful chippy brown one that belonged to my great grandma. It lives at my mom’s right now, but she knows that chicken wants to come live at my house someday. Pam you made me really smile, it is so hard when someone special gives you something!! Have a talk with the powers that be at Pottery Barn! I hope you will Come and enter my amazing Cross Bottle Guy Giveaway! (Artie)You will love it! 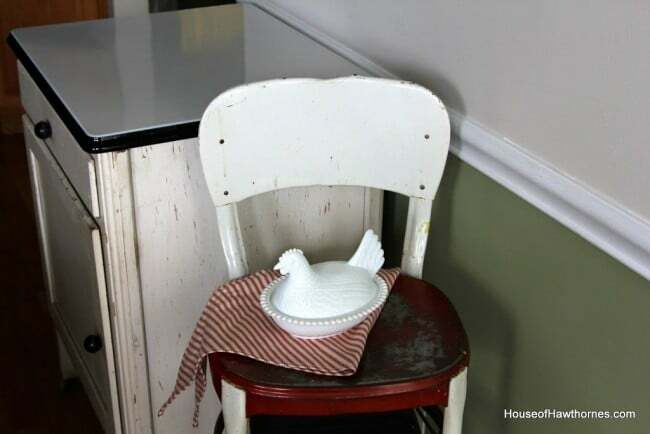 I have a vintage ceramic painted covered hen that was my grandmothers. It’s boxed away in the basement right now. Maybe I’d like it better with chocolate inside. Hmmmm…. I’ll take all the black jelly beans, please. These are so cute. I know what you mean about having a collectible that you aren’t quite sure what to do with it. I have a lot of my mom’s stuff; I don’t want to get rid of it because it was hers, but I’m not quite sure how to integrate these things into my collections. I agree with you about the jelly bean conspiracy. They put waaaaay too few red and orange in. We inherited two teeny tiny milk glass hens on nests last year. They were only two and a half inches long. They were so sweet, but I didn’t know what to do with them, so I sold them in my vintage shop on Etsy. I hope they found a good home. I love the hen in nests!! I have them in milk glass & cobalt blue. I agree that it is hard to decorate with them. 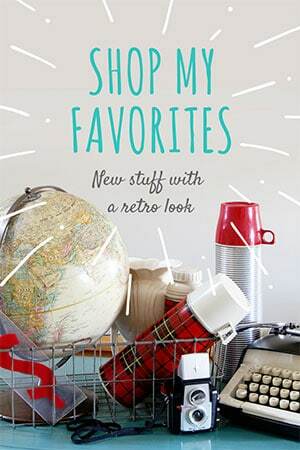 Mine are in a china cabinet with my enamelware collection. The jelly beans look great and add a nice pop of color but I couldn’t use them as a prop because I would be eating them all day!! Even though I buy and sell these hens on a nest, I have never quite understood their appeal. Actually jelly beans are a great idea! Personally, I would fill them with dark chocolate!!! 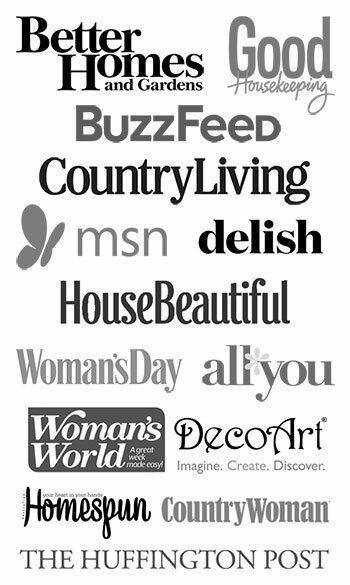 I do not have any but like the milk glass-love all milk glass. If it were a collection passed on by a loved one like yours is of course I would make it work no matter what. Happy Easter my friend. What a wonderful idea. A candy dish. this is perfect. I am going, tonight, to get mine out and put Reese’s mini eggs in it for Easter. Thank you so much for this idea. Mine was my mother’s and is in the china cabinet as well. I have a milk glass chicken, and I love her dearly. she lays the perfect eggs each Easter, and holds the butter at Thankgiving. I would love to see the pale pink chicken. now that’s a rare find! Hi Pam, I don’t have one of these, but they are adorable! I think buying the extra bag of jelly beans was sheer genius! Had two– now I’m down to one. The first one broke. It was a beautiful colbalt blue. The basket broke and all I had was the hen. Don’t know what happened to it after that. The other is purple with a white marble type vein going thru it. It’s so pretty. I love it! I have several of these. I have them on a window ledge -love the sun shining through them.